The ClamBook it the prettiest notebook dock I've ever seen. 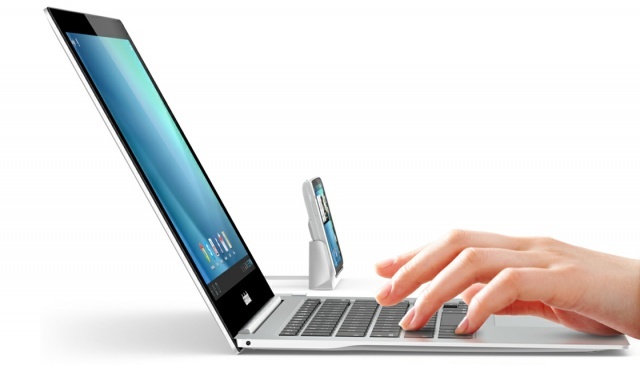 Built from sleek aluminum, the ClamBook is incredibly thin and light. It comes to life when you hook it up to your smartphone to see its content on the widescreen display, which is accompanied by a full-size QWERTY keyboard and a multitouch trackpad. 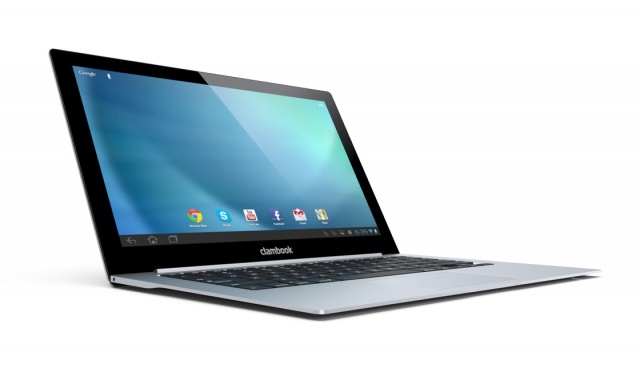 From the outside, the ClamBook looks just like a premium ultrabook that you’d happily hand over good money to own. Take a look at that image above — it looks just like a notebook that Apple would be proud to add its logo to. But on the inside, you’ll find no processor, no RAM, and no hard drive. That’s because it’s powered entirely by your iPhone or Android smartphone. The ClamBook combines a wireless keyboard with a widescreen display to become an ideal workstation for those who are always on the go, and it’s perfect for writing up your report or editing your spreadsheets on the train without contending with your smartphone’s tiny display. Some if its features include dedicated Android keys for instant access to media controls and apps; a 16:9 widescreen display with backlighting; 3D cinema sound; and a multi-touch trackpad that boasts two-finger scrolling, pinch to zoom, and more. The ClamBook will also charge your smartphone while it is connected. Although it is compatible with the iPhone, Apple’s limitations mean that trackpad is going to be useless, and you’ll still need to control all of your apps on the iPhone’s touchscreen. Which is a little disappointing. It goes without saying, then, that the ClamCase will be a better fit for your Android device, which can take full advantage of the ClamBook’s best features. ClamCase promises that the ClamBook will be available for this coming holiday season, but it is yet to announce a price for the device. You can register your interest now on the ClamCase website, and you’ll get an email to notify you when it’s available.